If only we were as concerned with how our “insides” look as much as our “outsides”! Have you ever considered how long we all spend “grooming” our hair, shaving our faces or bodies, washing & showering, applying creams, make-up & hair products? How long? Half an hour both morning and night, may be more? How much time do we spend buying clothes and dressing ourselves carefully? What’s the total time per day? Our society places massive emphasis on looking good. It’s part of human nature that we want to feel good about ourselves, feel confident in how we look. There is nothing wrong with that. I’m not criticising it! However, my next question is this. How much time do we spend thinking of how to make our insides look and feel good? How much time per day do we think about what we put in our mouths and the effect it has on our bodies? I think the reason why the amounts of times are so mis-matched is very simple. We see the outsides all the time but we never get to see the insides (unless we are gastro-enterologists). If we could see our insides, I bet we would give it a lot more thought and consideration. So I want to share my learnings. It’s time people were privy to seeing what our insides look like. We want to know that our face creams are making us look younger. Don’t we similarly want to see that the foods we are consuming are contributing to our longevity, not auto-immune diseases, cardiovascular disease, cancer, depression, diabetes and the like. For me, seeing is believing. Knowing isn’t knowing until you have experiences something. Diverticulosis on the left, diverticulitis on the right. Over the next few weeks, I would like explain how our foods cause this damage to our bodies, how they cause irritation to the delicate lining of our stomachs and intestines which in turn progresses to inflammation. Unresolved inflammation eventually causes the chronic (and preventable) diseases, now so prevalent in our western societies. This is my “energy giving juice,” as it comes from a selection of root vegetables and an apple. There are about 350 calories in it. Drink a small glass of it whenever you need a boost or crave something sweet. 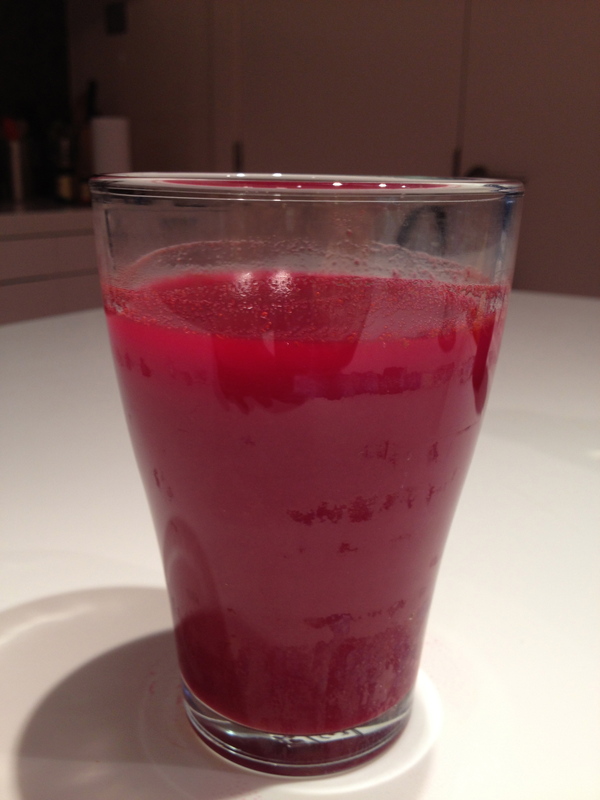 I call it my red juice, for obvious reasons, but without the beetroot, it would be orange in colour. What I’m trying to do is consume as many of the colours of the rainbow each and every day, combining the vegetables as I like. This is a nice and easy guarantee of getting the range of nutrients we all need. A diet rich in fruits and vegetables is your best bet for preventing every chronic disease. The evidence in support of this recommendation is so strong it has been endorsed by U.S. and U.K government health agencies and by virtually every major medical organisation, including the American Cancer Society. So don’t just take my word for it! Here is a link to a TED lecture presented by an American physician who was diagnosed with multiple sclerosis. She deteoriated to the point of living in a wheelchair, but later recovered her health by eating, as recommended, as rainbow of coloured whole foods and a paleo diet. Just click on it when you have 20 minutes. The substances which protect us against our diseases found in these fruits and vegetables, are phytochemicals. They include pigments such as carotenes, chlorophyll and flavonoids, also dietary fibre, enzymes and vitamin-like compounds. If you can consume these foods raw, you will preserve the enzymes (so helpful for easy digestion and maximum absorption), that’s why people have taken to juicing. Carotenes act as anti-oxidants and enhance our immune systems. Flanonoids act as anti-oxidants, have anti-tumor effects and also enhance our immune systems. Limonoids enhance detoxification and block carcinogens. Chlorophyll may stimulate haemoglobin and red blood cell production. Red – Beetroot, tomatoes, red pepper, strawberries, raspberries, red currents, cherries, red grapefruit, watermelon. Yellow – Yellow pepper, lemons, banana, pears, melons, apples, yellow grapefruit. Green – All green veggies & leaves, kiwi, avocado, limes…the list is endless. Blue/Black – Blackberries, blue berries, purple cabbage, plums, aubergines, red cabbage. Anyway, back to the method. Wash thoroughly and juice 2 carrots, 1 beetroot, half a sweet potato, a lemon or a lime, a chunk of ginger (size to your liking) and an apple if you want extra sweetness. That’s it. Drink in small amounts as you need to. I did look to do a mineral analysis on this juice, but the mineral content didn’t look that impressive. The vitamin values, however, were more significant. For example, this juice will provide you with well over the Vitamin A you need for a day. Also, least 50 % of Vit. C, 70% of B6, 50% of folate, 50% of B5, 25% of manganese we need each day. Beetroots are an excellent source of folic acid, fibre, manganese and potassium. They significantly help the liver in it’s detoxification functions. 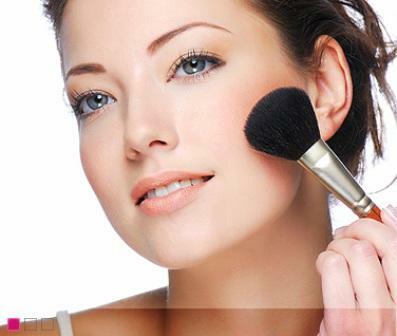 The pigment betacyanin gives it it’s vibrant colour and is a powerful anti-cancer fighting agent. Beetroot fibre (not found in the juice of course) has a good effect on bowel function and cholesterol levels. It raises the levels of anti-oxidants enzymes, specifically, gluthathione peroxidase and glutathione S-transferase, as well as increasing the number of white blood cells responsible for detecting and eliminating abnormal cells. In a study of patients with stomach cancer, beet juice was found to be a potent inhibitor of the formation of nitrosamines (cancer-causing compounds ingested as nitrates when we eat smoked or cured meats (look on the labels of processed meats, they all have nitrates and nitrites added as preservatives). Beetroot also inhibit cell mutations caused by theses nitrates. Carrots provide the highest source of pro-vitamin A carotenes. Two carrots provide roughly four times the RDA of Vitamin A. They also provide excellent levels of Vitamin K, biotin, Vitamin C, B6, B1 and potassium. They are high in anti-oxidants. They contain beta-carotene which we all know helps our night vision and similarly provide protection against macular degeneration and the development of senile cataracts. Sweet potato’s contain a unique storage protein with very high anti-oxidant properties. Generally, the darker the flesh, the more caroteines they contain. The help to stabilise blood sugars and improve the body’s response to insulin and and are hence called “anti-diabetic”. They are high in Vitamin C, Vit A, B6 manganese, copper. biotin, B5, B2 and fibre.